Last Chance To Comment On Orca Protection! The Task Force convened October 17-18 to discuss and refine the draft recommendations. The updated draft reflects the outcomes of those discussions. Comments must be submitted no later than midnight, Monday October 29, via the Task Force online public comment portal .Public comments received on this updated draft will be provided directly to the Task Force for consideration at their meeting on November 6, 2018. The final Year 1 report and recommendations are due to Governor Inslee on November 16, 2018. 3. 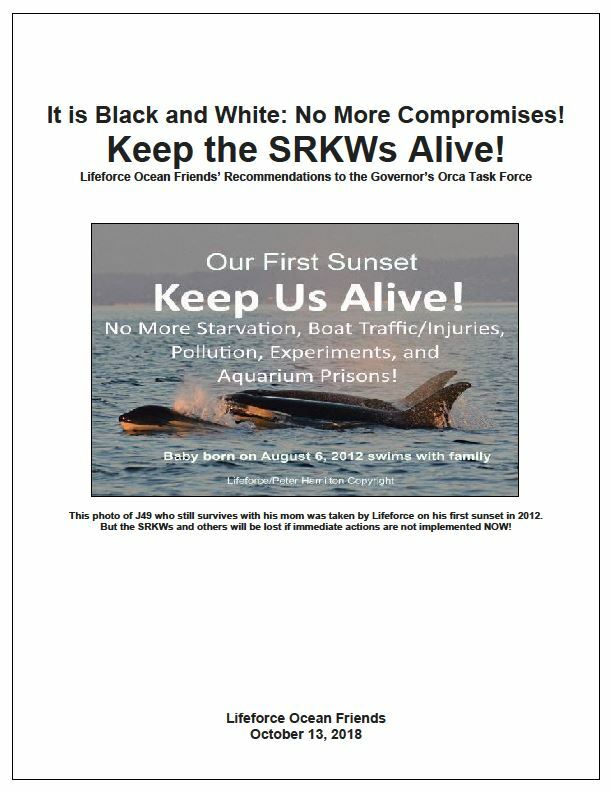 Comments Section: Post this Lifeforce Open Letter to Governor Inslee and Orca Task Force and any additional thoughts. Re: Helping or Harming Endangered Orcas? Please go to Lifeforce Ocean Friends for the complete Comment Information and Links: LIFEFORCE OCEAN FRIENDS. Thank You for Helping the Orcas!